Getting specifications right on a printed circuit board -- especially as components continue to shrink -- is a challenge. Best to have all the tools and reference you need right by your side! 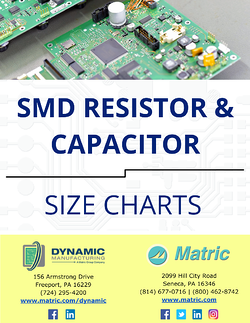 For those looking to buy or design with these tiny components, we’ve created an SMD resistor and capacitor sizes chart, along with a visual size comparison for easy reference. These are great ways to catch any pin pitch, width, and size mismatch between your footprint and the actual part. Fill out the brief form to the right, and we’ll email you this free PDF download. Feel free to share it with your engineering and purchasing colleagues!